Dr. Tuomas Mäkilä, Technology Research Center, University of Turku, Finland. Computers and the Internet changed people’s life style so rapidly in the last few decades. Today we are moving towards a hyperconnected era where humans and all the electronic devices that we use will be connected together and form a single network. Most of the machines will be also equipped with human senses such as audio, visual, and tactile. Therefore, we believe the next important breakthrough of internet would be true multisensory internet and this will open up a multitude of new horizons and opportunities for research in the future, including in areas such as human computer interaction, augmented / virtual reality, entertainment, medical and wellness, marketing and neuroscience. This special Issue of the journal will focus on fundamental and applied research dealing with multisensory Internet. 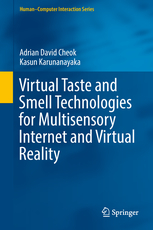 Such technologies may produce visual, tactile, sonic, taste, smell, flavor or any other kind of content that can enrich user experience delivered through Internet.